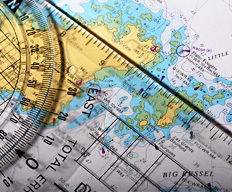 This course offers a great introduction to navigation and safety awareness for new or inexperienced skippers and crew, and those wanting to refresh their skills. In fact it's for anyone interested in sailing, motor boating, sea angling or diving, and works well in complementing our on-the-water training, such as the Powerboat Level 2, Start Yachting and Helmsman courses. It's a highly informative course with lots of opportunities for you to put your new found knowledge into practice. If you decide to take the course online, you will find many interactive exercises to help reinforce the information and lots of chances to try out what you've learned. This course covers; charts and publications , safety, engine checks, buoyage, tidal awareness, visual and electronic navigation, pilotage, rules of the road, anchoring, weather forecasts, and passage planning. Perfect introduction or refresher for anyone going afloat on inshore waters, and a stepping stone to the more in-depth Day Skipper shorebased course.